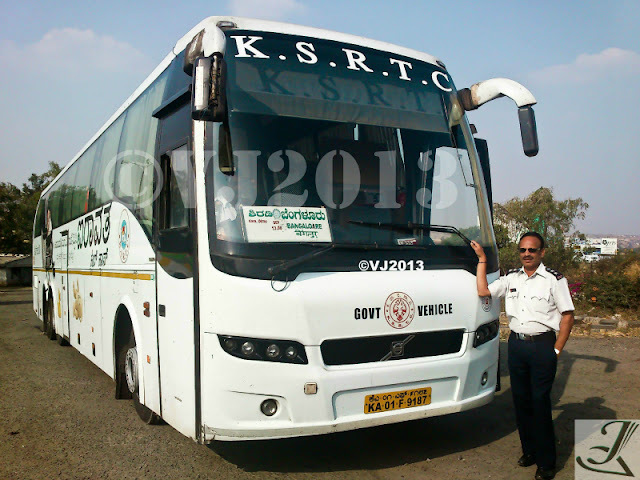 Schumi0101: A visit to Shirdi in KSRTC Airavat Club Class. A visit to Shirdi in KSRTC Airavat Club Class. A plan for a visit to Shirdi was on from the second week of January but due to unavailability of tickets in Airavat attributed by the rush factor at Shirdi ensured we postponed our trip for a later date. However, it was not until Wednesday that final plans were laid out and my friend booked the tickets on the bus. I usually start my year off with a visit to this Holy shrine with my friends. This visit is very special for me for two main reasons. 1. Starting off the year by taking the blessing of Sri Sai Baba. 2. As a bus fan enjoying the bus ride with my uncle driving the bus. All passengers were accounted for and we finally moved out of KBS at 13:15hrs. We made our way towards Navrang. Heavy traffic along the route ensured we moved at a snail’s pace. However the live TV inside the bus ensured the passengers were kept entertained all along. 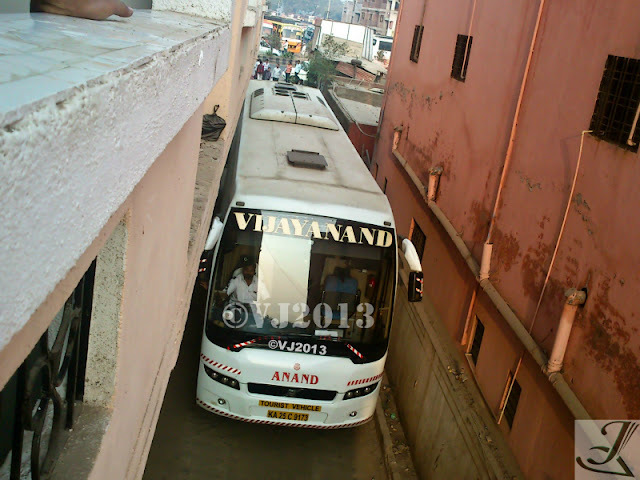 We did have few more passengers who boarded the bus at Navrang and finally we made out of Navrang and headed towards the Yeswanthpur –Nelamangala toll way. We reached the Nelamangala toll booth and as soon as we crossed the toll booth we pulled over at the gas station to feed our bus. Due to the recent hike in the price of diesel by Rs. 11 for bulk consumers, KSRTC buses heading to Tumkur and beyond fills up their diesel at this bunk. We took 552ltrs (appox) of fuel, enough to reach Shirdi and back. After this brief halt we made our way towards Inchara restaurant for our Lunch break. We were the only bus at this place. During this break a VRL B9R bound for Shirdi passed us. After our lunch break we resumed our journey and my uncle who was driving the bus ensured he kept the bus at a constant speed. We reached our next scheduled break, Kamat Upachar located between Davangere and Ranibennur. After a good 20mins stop here, we resumed our journey. I decided to get some shut eyes and the next thing I remember was being awakened by my friend Punyakeerthi, telling me that we were stopping for dinner. Here my uncle made way to the second driver while I paved my way for sleep. The comfort of club class ensured that I slept like a baby all along the journey. We reached Pune at 3:30am in the morning. We dropped few passengers at Swargate and continued on. Before reaching Swargate, we stopped for a leak break. After the break my uncle was back at the wheel. Me and Punyakeerthi joined my uncle at the front, and enjoyed the ride upfront. We accompanied him till Ahmednagar after which he insisted us to get some sleep. We reached Shirdi exactly at 7:25am and were dropped off at Holiday Park. This is one trip which I have been doing it for years now and it still remains the same. 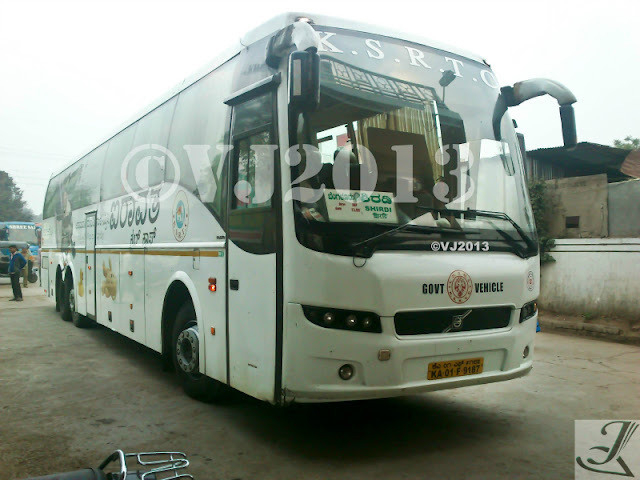 KSRTC dominates and wins hands down in this sector. While we were getting ready for the darshan, I saw the Konduskar I-shift come in at 8am while the VRL B9R arrived at 8:30am. Vasant Kamal provides #Best #Bangalore to #SHIRDI #Tour #Package by #flight.Vasant kamal has world class comfort, every inch of your travel is monitored by us to make sure you are traveling smoothly with highest comfort & SAFETY. Vasant Kamal provides Affordable Bangalore to SHIRDI tour package by Air from Banglore.